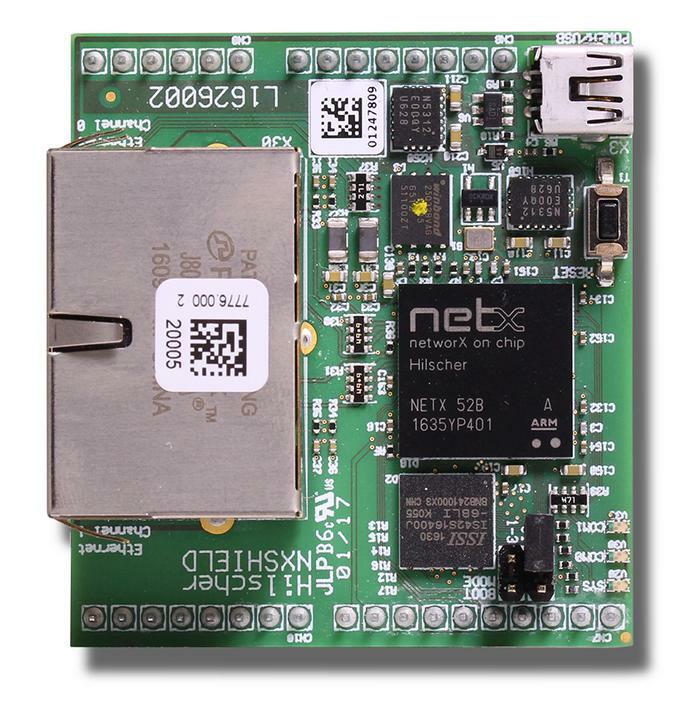 netSHIELD is an STM32 Nucleo expansion board with Arduino-compatible connectors. It is compatible with STM32 Nucleo-64 and Nucleo-144. netSHIELD enables the user to connect an STM32-based application to all market relevant real-time Ethernet industrial networks with best-in-class real-time capabilities, like PROFINET®, Ethernet/IP™, EtherCAT® and others. The netX SoC architecture is designed from the ground up for the highest demands on flexibility, determinism and performance in terms of multi-protocol capability, and low latency for short cycle times. The heterogeneous multi-core architecture features an ARM processor core coupled with a flexible communication sub system (xC) to support a variety of industrial applications. The communication sub system, that is, the Protocol stack, runs independently on the netX SoC and requires only small memory and very limited CPU resources from the STM32 host microcontroller. A protocol-specific firmware image for the netX network controller is stored in a serial Flash memory. This product is supplied by a third party not affiliated to STMicroelectronics. For the latest information on the specification and the package of the purchased parts, refer to the third-party website at www.hilscher.com.